HYDERABAD: Badin journalists took to Hyderabad’s streets on Monday against the government’s decision to book around 11 media persons in FIRs, three of them charged under the anti-terrorism act (ATA). The journalists were nominated in the FIRs that were registered against estranged Pakistan Peoples Party (PPP) leader DrZulfiqarMirza, who is also a former provincial home minister. “Our actual crime is that we reported what was taking place in Badin,” claimed Badin Press Club president TanveerArain, referring to the police siege outside Mirza’s farmhouse and the expected storming of his residence. Araid led the journalists from his district at a protest in Hyderabad on Monday. Several rights activists and local journalists also participated in the demonstration. While the provincial government on Monday apologised in the Sindh High Court for the assault on the media in Karachi, their counterparts in Badin have not been so lucky. “We have never had such a troublesome patch before,” said Arain. The booked media men include MumtazMemon, YousufJani, DirMurad Mari, Shankar Kumar, Meharrudin Mari, NiazMemon, ShafqatPinyaro, AacharAzeem, Haji Khan Lashari and MurtazaMemon. They all have been nominated in half-a-dozen FIRs, including one lodged at Darakshan police station in Karachi. Mari, Lashari and MurtazaMemon have been charged under ATA sections in the FIR lodged against Mirza and his supporters for storming the police station. Moreover, Mari has been named in four cases and Lashari in two. Arain accused Badin SSP Khalid Mustafa Korai for persecuting his colleagues on behalf of the ruling party. Korai was, however, unavailable for comments. Having rebuffed this offer, they demanded the formation of a judicial commission to probe their alleged involvement in the crimes ascribed to them. The regional incharge of Human Rights Commission of Pakistan, DrAshothamaLuhano, also visited Badin on a fact-finding mission last week and observed the “prevalence of fear and political victimisation”. “The police are raiding homes, beating people, affecting businesses and hampering professional duties of the media men,” he said. PunhalSaryo, a rights activist who heads HariPorhiyat Council, remarked that protesting journalists were never charged under the terrorism law even during martial law regimes. He also pointed out that an economic war lies at the root of the issue, with huge deposits of oil, gas, coal, copper and gold, and rich coastal fishing, sugar industries and agriculture. “Mirza has considerable support among the masses,” he said. 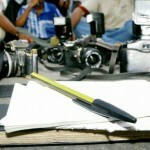 The post Badin journalists take to streets against cases registered against colleagues appeared first on Pakistan Press Foundation (PPF).